Know about the different types of dosages forms as liquid, solid and external, manufactured in pharmaceuticals. A drug is defined as a substance used for diagnosis, prevention and treatment of disease. A dosage form of a drug is a product suited for administration to the patient by various routes for diagnosis or treatment of disease. 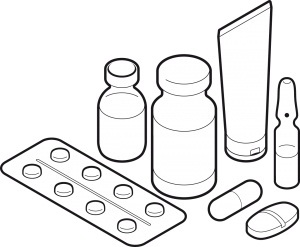 Suitable dosage forms are needed for protection of the drug from destructive influences of the atmospheric oxygen or moisture, for protection of drug from destruction from gastric acid on oral administration, to mask bitter taste and foul odor, to provide extended drug action through controlled release mechanism etc. Following agents are used with the drug in the suitable dosage form. Vehicles: These are used to dissolve or suspend drugs. They are also used to mask the bad taste of the drug. Colouring Agents: These are harmless substances used for the lending color to drugs to make them more acceptable to patients. Sweetening Agents: Solid sweetening agents as sucrose and cane sugar are usually used for Syrups and Elixirs. Saccharin, about 500 times sweeter than sugar, is non-caloric and may be used by diabetics or obese patients to restrict their carbohydrate intake. But there is a suspicion that saccharin is carcinogenic. Aspartame is 200 times sweeter than sugar and has been cleared as a safe sugar substitute. It is metabolized in the body like proteins but it loses its sweetness under heat, making it unsuitable for sweetening baked confectionery. Flavouring Agents: ‘Flavour’ refers to a mixed sensation of taste, touch, smell, sight and sound. The four primary tastes are sweet, sour, bitter and saline. Proper selection of flavor has to be made to mask nauseating medicines bitter sour, saline and oily tastes. Aqueous Solutions contain one or more drugs dissolved in water. There are 2 categories: Solutions for oral use and solutions for injection which are sterile liquids or suspensions packed in suitable containers. The aqueous vehicles mostly used for preparing injections are water for injection and Sodium Chloride Injection. Injections are available in sealed glass ampoules or vials. 1. Emulsions: Suspension of fats or oils in water with aid of an emulsifying agent. The oil particles are coated with the emulsifying agent so that they do not coalesce as the interfacial tension between the oil and water is lowered. Thus a stable suspension is produced. 2. Gels are colloidal aqueous suspensions of hydrated inorganic substances. 3. Magmas are bulky suspensions of poorly soluble substances in water.They are also called ‘Milk s’ as they are white in color. Magmas and Gels are similar except that the particles suspended in Magma are larger. Thus Magmas tend to separate on standing and require a ‘shake well before use’ label. 4. Mixtures are preparations where drug or drugs are in solution or suspension meant for oral administration. Spirits or Essences are concentrated alcoholic solutions of volatile substances. The dissolved substance may be solid, liquid or gaseous. Most spirits contain 5 – 20 % of the active material. Spirits containing volatile oils are prepared by diluting 10 volumes of oil with 90 volumes of alcohol and coloring material may also be added. Many spirits are used as flavoring agents. Extractive preparations are made from vegetable drugs and contain the active principles in a hydroalcoholic solvent called menstruum. Tinctures are alcoholic or hydroalcoholic preparations of vegetable drugs. Some commonly used solid dosage forms are Powders. These are medicinal substances in a dried and finely divided form. Powders are used internally and externally. Effervescent powders when dissolved in water liberate carbon dioxide which makes the preparation more palatable. Capsules are small containers usually made of gelatin. Capsules are one of the most popular form s for oral administration of powder, oil and liquids. They dissolve readily in the stomach and make the contents available for absorption. Capsules may be coated with substances that resist the action of gastric juice and do not disintegrate in the stomach but on reaching the intestines they dissolve in alkaline juices and release the drug. On occasions, capsules may be administered rectally or vaginally. Tablets are solid dosage forms containing granulated or powdered drugs that are compressed or molded into round or other shapes. They may be made with or without diluents and may differ greatly in size, shape and weight. Tablets usually contain in addition to the drug a diluent, a binder, a disintegrator and a lubricant. Diluents are used when the amount of the active ingredient is small and the lubricant keeps the tablet from sticking to the machine. Disintegrator like starch swells up the tablet to split readily in the stomach, as starch swells upon contact with moisture. Tablets may be coated to enhance their palatability. Pellets are sterile spheres formed by compression. Pills are powdered drugs mixed with adhesive substances. Nowadays these have been replaced by Tablets and Capsules. Troches or Lozenges are flat, round preparations that are kept in mouth till they dissolve liberating the drug or drugs they contain. Liniments are liquid suspensions or dispersions, applied to the skin by rubbing.They usually contain an anodyne (to relieve pain) or rubefacient (to redden the skin). Lotions are liquid preparations applied to the skin without rubbing. Lotions can be protective, emollient, cooling, cleansing, astringent or antipruritic depending on their content. Ointments are semisolid greasy substances intended for local application to the skin or mucous membranes. Ophthalmic ointments are sterile medicated ointments for use in the eye. Pastes are ointments like preparations of one or more medicaments and some adhesive material. They are applied to oozing surfaces and afford greater protection and more absorptive action than ointments. Suppositories are mixtures of drugs with a firm base that can be molded in shapes suitable for insertion into a body cavity or orifice. Sprays are a solution of one or more drugs in oil or water, administered by atomizers. Inhalants are drugs which because of their high vapor pressure can be carried into the nasal passages with the inhaled air. Plz also mention for the softgel study matters.